On the plus side, after he got done asking this question, the filmmakers only had 50 more minutes of that hour left to fill. And you know they had smart scientists on the show, because one actually provided a cogent answer. Here’s what really kills the premise with this program—PBS did a lousy job editing because they had nothing better to show us. That’s the only justification for content like this. Alan was sent to six different countries to visit archaeological sites that all look the same anyway, so it’s hard to believe they couldn’t afford to do another take on that burning question of his. And as for the visuals, this filmmaker was thoroughly offended (more on this in a minute). The entirety of the show, experts throw huge abstract numbers at the audience: this skull is fifty thousand years old; this bead is over a hundred twenty thousand years old; here’s an imitation sea-shell from two hundred thousand years ago. It’s easier to read them here on the page, but that’s my point. Would it have killed them to put a lousy timeline up on the screen for 10 seconds? The only visual they could afford was a pirated Google Earth frame to show us where the neanderthals camped out. They had imitation sea-shells at that campfire. We just don’t know when. In case you risk watching this travesty and twenty minutes in you choke on your own boredom, let ScriptPhD.com fill you in on what you missed during the last half hour: Alda shoots primitive projectile weapons at a plastic reindeer. (Yes, PBS members, your money is being well-spent!) The production crew craft an authentic stone-age spear, but instead of throwing it like our humanoid ancestors, Alda’s cheating with a fancy spear-thrower. And he still can’t hit a stationary Christmas decoration! After ten minutes of hopeful attempts ending in bitter disappointment comes the best part: he purportedly hits the thing, but we miss it because the camera’s zoomed in on his face, then it pans over to where someone obviously stuck a spear into the deer’s behind. With effects like that, who needs James Cameron? 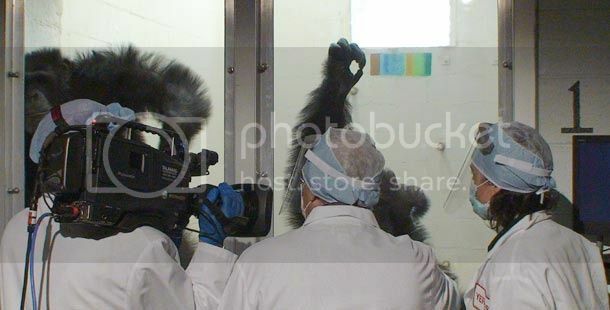 Biologist Lisa Parr (right) and Alan Alda (center) attempt to work on a computer task with a distracted chimp, Hondo, as cameraman Peter Hoving films. Photo: Maggie Villiger, ©2009 PBS, all rights reserved. Episode Two is an examination of what separates us from chimpanzees, our closest genetic relative. The second installment demonstrates even more clearly that poor presentation can be the death of good content. We’re greeted in this episode by Alda sitting between a chimp and a human child. As he clumsily reads the opening statement from the teleprompter, the kid jumps in with an answer to one of the rhetorical questions, but Alan just talks over him. No one thought that was worth a second take, but this time I think I know why. Across the table from that outspoken little boy was a menacing ball of barely-contained bloodlust. Apart from some developmental psychology, you will learn one important thing from this episode: chimpanzees hate Alan Alda. I’m talking about Hondo, The Human Spark’s sympathetic antagonist. Hondo is a male chimpanzee with an unfortunate childhood that would make Jane Goodall cry: stripped from his family at a young age, denied the furry harem that was his genetic birthright. Day after day, he endures the seemingly trivial experiments of his human captors, given a 50% chance at extracting a measly grape for his efforts. The biologist who describes his characteristics may or may not have finished puberty, his voice cracking with glee as he and Alda share some ground-breaking connection between monkey and car salesman. Does it surprise any of us 99 percenters that Hondo risks it all for one noble shot at wiping that disoriented grin off the aging star’s face? As our host and his eager partner-in-science engage in yet another conversation that didn’t need to be televised for a viewing public, I found myself rooting for Hondo as he hurls himself against the protective glass, proving that even though he can’t best a three year old at logic puzzles, this chimp knows a thing or two about the human spark. And who can blame Hondo’s aggression, with a format born of the logic that to educate does not mean to entertain. “You’re getting it all wrong!” his expression screams as he fails another test to determine whether he can understand the concept of weight, and throws himself in frustration at the bars between him and his inquisitors. In all seriousness, the presentation does a huge disservice to the undeniable brilliance of the researchers introduced during this segment, particularly since PBS’s mantra is to educate through entertainment. These scientists are people who’ve devoted their entire professional lives to studying what it means to be human, people who conduct seemingly cutting-edge research, yet the program feels like a perfunctory grade-school field trip. How is it even possible to capture monkeys on camera for any extended period of time without it being entertaining? Episode 2 is a point-counterpoint competition between children and chimpanzees that showcases the somewhat mundane scientific method (performing test after test to discover the key differences in psychology). Although these tests illustrate the evidence, the conclusions drawn from them are much more exciting than the process. The research hints at powerful revelations: the way human children are programmed to teach and learn may give us an evolutionary leg up. But even here, one is left with a lingering doubt: what if the human subjects are more teachable because they’re all children? The Human Spark would have us believe that the kid wins out because the adult chimpanzee would rather pursue the grape with his own strategy, ignoring the researcher’s demonstration. But don’t we afford the human adult the same courtesy, to ignore all rational advice and pleading, just go out and buy the boat, marry the fifth wife? My decidedly human confidence is not bolstered when, after being shown a box with both sliding and pull-out doors to reach the same grape, Alan can’t figure out how to get the darn thing open, either. Shocking as it might be to believe, the final round of this documentary is the most exasperating. For one thing, it’s the most self-indulgent. As the camera rolls, Alda volunteers himself to the latest and greatest in brain imaging techniques, and some nervous tech compliments him on how bereft of open space his skull cavity remains. After some painful filler including re-used footage from the previous two episodes, we get to watch as different spots on his brain light up in correspondence with different actions. To reiterate, interesting conclusions masked by poor presentation. Nothing envelops an evening with a drowsy warmth like linguistics. At one point, it seems we are to believe that grammar is the root of the human spark. In as much time as it takes to start denying that to yourself, we’ve moved on to religion, coupled with a cheesy montage of people presumably…being religious. And then, like that poor chimpanzee on a crash course for Alda’s head, a relatively startling and profound conclusion: mankind’s ability to think and strategize about the future sets him apart, and one of these brains can (almost) prove it. Film is a visual medium. Hearing scientists explain their research is one thing, but forcing us to watch them do it rather than illustrating the concepts is uncreative and lazy. Brilliant as they are, rarely would one of them dare to send an unedited, offhand remark out to their colleagues for peer-review, so why is this acceptable for public consumption? It’s just bad television. So is the lack of adequate visuals that even daytime cable programming can muster and the poor editing that accompanied this performance. Some of the backgrounds looked like they were slapped together from iMovie, which is a fine rudimentary program when you’re putting together your baby’s first steps to show grandma. Finally, economy. If running a dramatic series for twelve episodes throughout the season, maybe you might show some flashbacks during the finale to remind viewers of key plot points. But a three-part science special doesn’t need to be recycling footage from the first two to fill its third episode. There were about forty minutes of good material that were made to last three hours. Leaving in bad takes and long-winded responses to fill that time is an insult to the PBS audience’s attention span. Programs like this make up the nerdy half of the void that inspires blogs like this one. On the other side, you’ve got entertainers making a mockery of the realities of science, and before you lie the fruits of educators using a bludgeon where a crime-scene investigation would have done nicely. 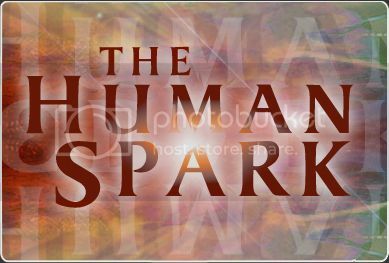 The Human Spark premieres January 6, 13, and 20, 2010 at 8pm on PBS (check local listings). ScriptPhD.com covers science and technology in entertainment, media and pop culture. Follow us on Twitter and our Facebook fan page. Subscribe to free email notifications of new posts on our home page. This review supports the trope that the academy is an ivory tower where effete academics drenched in their exaggerated sense of self importance labor over each opportunity to hyper critically deconstruct the ideas and arguments of others to sustain their disconnected-from-common-lives constructions of reality. Some of the points made are valid, but the main point – and the one that the reviewer missed here – is that the program was not produced for the small especially well-educated minority of elites seem to believe that we are all here to validate their inflated egos by delivering a product worthy of their time, which they seem to presume (given their previously mentioned exaggerated sense of self importance) is somehow more precious than we can imagine. I hold two Masters degrees from a Big Ten school, major research institution, and I have been working in the field facilitating constructive social engagements in the Afro-Brazilian cultural epicenter. I’m less enamored with the academy, which I think is far more deserving of criticism than this three-part video presentation. Undergraduate school is the new high school, where young people are still asked to sit in rows of little desks looking at the backs of the heads of those in front of them like forward facing empty vessels to be filled with the wisdom of the ages. So the series is indeed flawed, but it speaks to a broader audience in a way that might just make it easier for them to understand. If it fails to lie up to the standards of a peer reviewed journal so what. The most relevant question here is, does it inspire the imagination? It inspired my imagination and I appreciated the fact that it was presented in a way that I believe would allow it to inspire the imaginations of, and foster critical thinking among, both younger and older, less well-educated and less sophisticated audiences. Through my NGO in Brazil I have met many young and old volunteers who might not fit into “the club” but, rather than talking, are taking the time to make a difference. People like these are often inspired by productions like The Human Spark. So, sure, the reviewer is warranted to note that there were shortcomings, but in this case it seems to me that his tirade has contributed to the stereotypes of academics which alienate so many people. Thank you for the honest and forthright comment. I would like to point out, however, that you are the only academic present in this discussion. I am a student of a professional master’s program, not an academic PhD, which focuses on selling screenplays and competing in the Real World. And I respectfully believe you completely missed my point. My issue with the Human Spark is not that its intentions were incorrect, but that they were poorly produced. Film is a visual medium. If you made a film about your Afro-Brazilian studies, would you put intellectuals on screen and let them simply talk for five minutes in front of the camera, or would you try to present visuals that illustrate what they’re talking about? I’m not asking for a higher budget, just better management of the one they had. My point about peer review was that the academics used for the series would choose and review their words (i.e. edit them) before they sent their papers out to peer review, so the producers of the show should follow the same example and edit their content before putting it out for the general consumption. Your frustrations actually ECHO my own: this show should have been an inspiration to young people, but it did not meet my expectations because there wasn’t enough, well, spectacle, to hold the interest of a non-academic under the age of fifty.